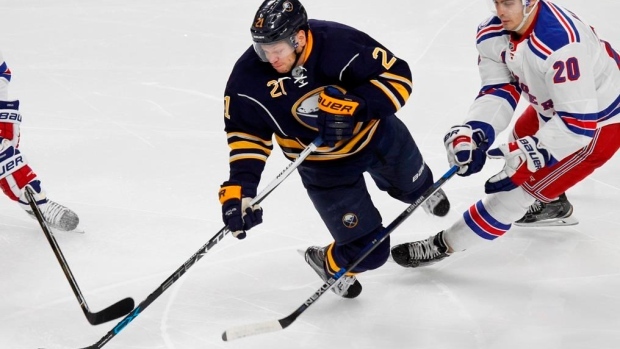 BUFFALO, N.Y. — Buffalo Sabres forward Kyle Okposo is showing signs of improving from an undisclosed illness, though there is no timetable yet as to when he might be released from the hospital, a person with direct knowledge of the player's condition told The Associated Press on Friday. The person spoke to The AP on the condition of anonymity because the Sabres have not provided any updates since announcing Okposo is under the care of team doctors on Wednesday. Okposo has been undergoing a battery of tests at Buffalo General Hospital's neurosurgical intensive care unit since Sunday. He's been sidelined since complaining of an illness hours before the Sabres game at Columbus on March 28. Okposo had just returned to the lineup and played two games after missing 10 because of a rib injury. Following practice Friday, coach Dan Bylsma said he had no update on Okposo's condition. "It's something we're all playing with right now," Bylsma said. "It's a difficult situation and a difficult time for Kyle and his family, and one we want to do everything we can to be with him and help him through the time that he's in right now." Buffalo has been eliminated from the playoffs and closes the season playing at Florida on Saturday and Tampa Bay on Sunday. In his first season with the Sabres, the 28-year-old Okposo has quickly emerged as a team favourite and respected leader. Okposo spent his first nine seasons with the New York Islanders before the unrestricted free agent signed a seven-year, $42 million contract with Buffalo in July. "It's really unfortunate and scary, and our thoughts and prayers are with him and hopefully he recovers soon," Sabres defenceman Jake McCabe said. "It's one of those things where he'd do anything for you and we feel the same way: If there's anything we could do for him, we would do for him." Sabres forward Marcus Foligno will miss the final two games after hurting his knee in a 2-1 win against Montreal on Wednesday. Bylsma described injury as being minor. The Sabres assigned defenceman Brendan Guhle to their American Hockey League affiliate in Rochester. Guhle was Buffalo's second-round pick in the 2015 draft and completed his season with Prince George of the Western Hockey League.